CSD Frankfurt is the city’s version of Pride. The event takes place every July and attracts more than 200,000 visitors to the city. The entire weekend event includes parties, parades and outdoor concerts. Frankfurt Christopher Street Day – A City Pride! CSD is Germany’s and Switzerland’s counterpart to the pride parades and took its name from New York’s Christopher Street, of course, where the historic bar Stonewall is located.The name is slightly different, but the fun is just the same as everywhere else in the world.The festivities last all weekend with amazing concerts, live open air shows and of course the main parade. Everything comes together at Konstablerwache, Frankfurt, 60311. The parade takes place on the final Saturday of the weekend with thousands of spectators taking to the streets of Frankfurt. The event, while still quite political, is fun and friendly and manages to combine the best of pride, delivering important messages but also celebrating diversity and independence.Visitors come from all over Europe and beyond to celebrate in the Sun. Each year the event has a different theme, striving for equality for LGBT Germans across the country. Concerts, parties and more make up an entire weekend of celebrations.The entire event is supported by the Municipal government and the local mayor. Several charitable events also take place during the event to support local gay causes. Hotels fill up quickly so you are advised to book early. Weather in July is warm so don’t be modest when it comes to your costume.Visitors come from all over Europe and beyond to celebrate in the Sun. Including some great aerial footage! 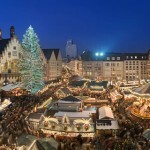 The Frankfurt christmas Market is one of the most important Christmas markets in Germany. The elaborate and creative stand decorations, the scenic surroundings of the Römerberg and Paulsplatz and the huge christmas tree also make it one of its most beautiful.